The backing for these exercises follows the chord progression Am, C, G, F. Each chord lasts for one bar, so for the first exercise the backing is Am, then C, and for the second exercise the backing is G, then F – so you can play the exercises continuously. Play the exercises at 50bpm (4/4) when you first start, as accuracy is a must! After you’ve got them nailed, gradually increase the tempo. This example features a sequencing pattern that is very common in rock soloing. At first, work on it in one- or two-bar sections, before linking it all together and increasing the tempo. Throughout the process, concentrate on your picking, vibrato, accuracy and timing. When playing three-notes-per string patterns always keep the first finger down and stretch with the other fingers. Hop your first finger over when changing strings. Bar 1 is an example of a common rock lick based on a pedal note (the C note on the 8th fret, first string), followed in bar 2 by a sequenced descending pentatonic scale, as favoured by Jimmy Page. The last two notes in bar 3 (ie, A and G#) should be played with your first finger sliding quickly from the 10th fret to the 9th fret. Keep the fingers as close as possible to the fretboard for maximum efficiency. This lick is influenced by Paul Gilbert’s style of playing. Work on individual bars, licks and arpeggios before linking everything together. Bar 2 is an example of descending a single string in groups of four (tip: use your first finger to slide up from the third note to the fourth note of every 16th note grouping). Bars 3 and 4 feature big stretches and string skips, so watch you don’t tense up. Remember, tension and pain means you’re pushing yourself too hard, so time for a rest! This is a legato-based example exploring common sequencing patterns. For best results, use the picking suggested to maintain consistency when playing faster. Alternatively, you may like to try the ascending scalic run by hammering your first finger onto every new string to strengthen your fretting hand, or alternate pick every note to work your picking hand. 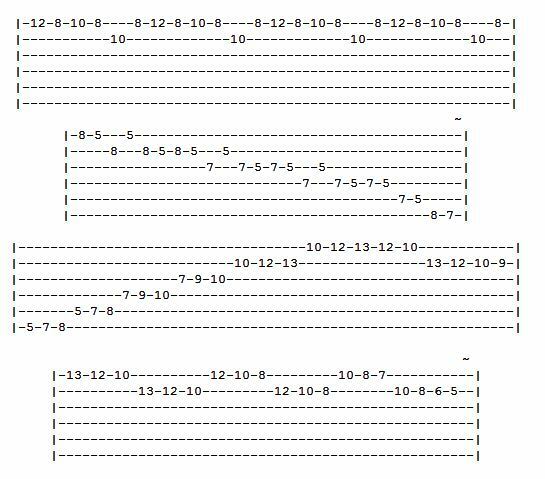 This sequence is based on an approach used by many rock guitarists such as Joe Satriani and Steve Vai for a ‘slippery smooth’ sound. The pick should be used in the first bar only, but if you find this too hard pick the notes shown in red (the red denotes a fretting hand hammer-on). The sliding is generally done with the first or the fourth finger, except for the last slide, which should be played using the third finger. 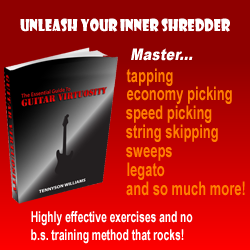 If you enjoyed this lesson, and want a book full of similar lessons and exercises, Shredaholic recommends starting off with The Essential Guide to Guitar Virtuosity! First time I’ve visited this site (first foray into shred after 30+ years playing too), looks great but it always helps me to have a sound file, any plans for this? I like the Vai and Satch references. Good stuff here.